I once knew someone whose mental map of the town he lived in was punctuated by pubs. Giving directions, he'd say something like 'Turn left at the King's Arms and carry on till you get to the Ship and Castle ….' That's certainly one way of visualising a territory. Travelling over longer distances most people rely on a representation of the road system to guide them, either as a printed road atlas (my preference) or increasingly now, such a road system contained digitally in a SatNav. But roads are superimposed on landscapes. What about the mental experience of moving across the contours of the land? I suppose this varies; some might notice the view, others listen to the radio or talk to a passenger while just concentrating on the road ahead and direction signs. I do these things, but part of me is also conscious of the rise and fall of the ground and of watersheds. So for me journeys are also an experience of traversing river systems. In unfamiliar areas I watch for rivers, trying to notice their names and the areas of high ground around them bringing down streams to join the rivers. On familiar journeys I'm already acutely aware of where the rivers are. One journey I often make follows the upper course of the River Wye after it runs off the mountain of Pumlummon in Mid Wales. Initially I travel along the valley of the River Rheidol which has its source on the same mountain. Crossing a tributary of the Rheidol - the River Melindwr - the road begins to climb to high ground initially away from the river itself, but still within its catchment. Eventually the road crosses the Rheidol where it comes down off the mountain and runs along by the side of the River Castell as it flows towards the Rheidol. Eventually the Rheidol catchment is left behind at the highest point of the road and almost immediately the road crosses one of the upper arms of the River Wye - the Tarrenig - which then runs alongside the road flowing away from the Rheidol catchment. A different watershed. Soon the other upper arm, the Wye itself, also runs under the road and the two streams become one. Sometimes I get out of the car here and walk the short distance to the confluence. 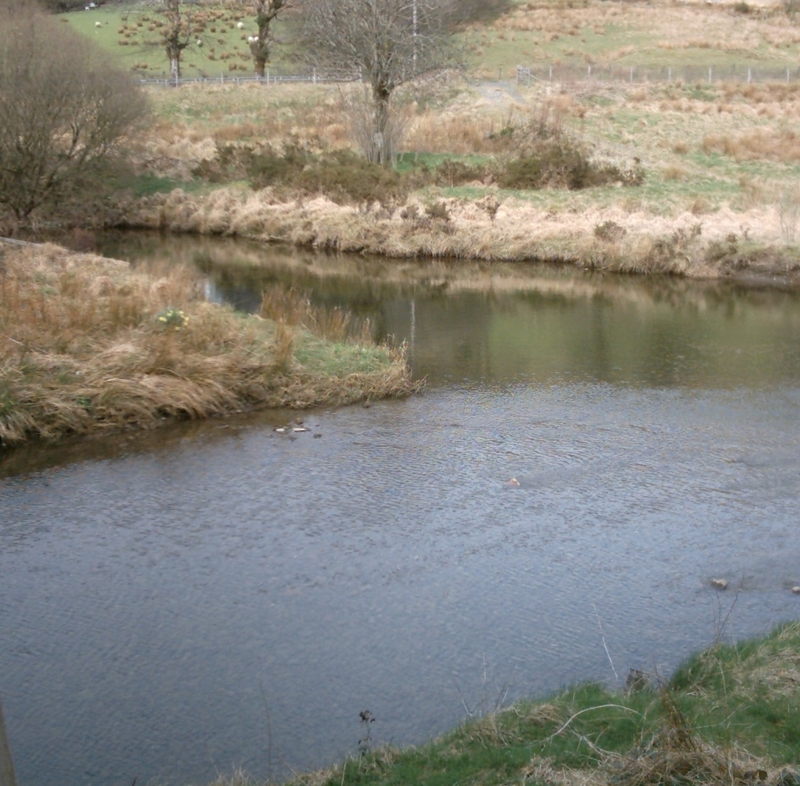 One stream, which has been running more or less level for a while, is placid with a smooth surface, while the other still ripples after its downward rush. The Wye then winds down its upper valley with the road running just above it. Another place I often stop is a convenient lay-by from which a path leads down into a gorge with a footbridge across the river and a mossy oakwood covering the far slope. It's an atmospheric spot, spoilt only by an over-large blue sign which designates an allowed launching place for kayaks onto the river, though I've never seen any. Downstream the River Marteg can be seen from the footbridge rushing into the Wye from the Gilfach nature reserve. From here the river continues alongside the road to Rhaeadr Gwy - or simply 'Rhayader' in English, the Welsh name indicating that here a waterfall brings the river out of its series of gorges to a wider, shallower flow across a broader valley. Soon the River Elan joins it, a confluence beneath ancient woodland some way from the road. 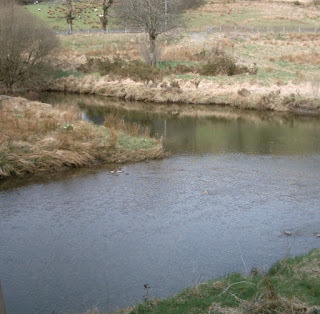 But soon the road meets the river again and then crosses it in the town of Builth Wells (Llanfair ym Muallt) and then runs along the other side of the wide stony flow for a further stretch until there is a parting of the ways. One road continues to follow the Wye to the book town of Hay from where it flows out of Wales towards Hereford. The other turns towards the town of Brecon (Aberhonddu) where the River Honddu flows into the River Usk and the streams are now running off a different watershed heading south.